The LibraryThing Android app is here! The LibraryThing Android app has arrived! Update: I made a fun video of me cataloging my fiction collection. Check it out. Flawless download to my Samsung S8 (Android 7.0, Nougat) and the sign-in procedure was a piece of cake. Will be playing with this all day. Thank you all so much for the time and hard work that has gone into this! (Small feature request - can we toggle Your books to display title/author only without covers?) No it's not as pretty, but it takes up a lot less space that way. >4 reading_fox: It's not currently in the plans, as far as I know, but I'll pass along to devs! >5 lorannen: Thanks! (I know out for just a few minutes and already the users are being picky). Please thank them at the same time! Just having something that is usable and seamlessly integrated into the 'main' site is a real bonus, it looks and feels great to use. >6 davidgn: The plan is that Readar will get rolled into the main LTApp. No official dates on that, but that's the plan. Thanks for getting an Android version out to us. I hope it will be useful in checking and updating our book database. My initial disappointment is that there is no offline functionality. Being able to update my reading when no WiFi or cell data is available (on a cruise) or very expensive would be VERY helpful. Most Android phones have the benefit of an SD card, often providing a lot of extra storage space, so having a copy of the data on the SD card should be at least an option. Google Play tells me there had been 1000 downloads before I got there. Should have taken a screenshot of the search predictions; as soon as I put in "library", a whole bunch of "librarything" choices appeared, with "librarything app" near the top of the list. I just downloaded it, so I haven't had time to play with it yet. I'm looking forward to using it. I installed the app as soon as I saw the announcement, yay. It all worked smoothly, but I did run into a bit of trouble when I tested the add book feature: it added the book via the barcode scanner just fine. When I went to edit the entry, I ended up on the book page of the full site, and while I was able to edit my tags there, I couldn't get back to the app's home or catalog view using the app's navigation. I had to use my phone's "back" button to bring me back to the main app page. I have an LG V20 Android version 7.0 if that helps. I had the beta version, and when I look in the Play store I see that the app shows as "Installed", but is still labeled for me with "Beta", and it thinks I am up-to-date (I have autoupdate turned on for this app.) Do I need to uninstall and reinstall to get the current version, or is the labeling just stale? >15 southernbooklady: That sounds to me like everything's working the way it's supposed to. Using Android's back button is the way to get back into the app, proper. >16 lorax: We're looking into that. I think it's just a side-effect of the beta process. No worries. No need to reinstall. >17 lorannen: Okay, I won't worry about it, then. 2. At the bottom of the Play Store page there is an option to leave the beta program. Click that and within a few minutes you'll get a normal Play Store page for LT. You'll have to install the app again. Downloaded the new app to both my phone (Samsung Note5) and to my Nook HD+ tablet. I know the ability to upload new books on the latter will be limited by its lack of a camera, but am excited by the ability to search my library while in Barnes & Noble. Happy day...! Addendum: Have been playing around with the 'Cover Explorer' to identify books in my library that still need the correct covers, and then use the camera to take a photo of my books' covers. Results aren't perfect, but not bad either. I'm in! Woot! Thank you! Wow lighning fast barcode scanning ! Thank you ! I played around on it today, and really like its easy functionality! THANK YOU, LT! Great news! I know what I'll be doing as soon as I next turn on my phone. Having this access in used book stores will be a great help! >link_rae: I've created a separate 'collection' for ebooks, as well as one for those I've read but don't own, and another as a wish list. Those do show when looking at an individual title, though not on the list of all titles. Hope that idea helps a bit - like you, I have been known to purchase some books in multiple formats (for a variety of reasons). Great. Nice work. Thank you. I haven't found out yet how to switch off covers. Isn't that possible? >29 Ravic: Covers are always visible, although there are two view modes and the covers are much smaller in list mode. Downloaded the official version of the app . Everything is working nicely . Looking forward to more functions coming in the near future . Hopefully tagging and recommendations will soon be on the app ! Luckely I got through, but wanted to let you all know that link on the popup was broken. >32 Yamanekotei: Good catch, and thanks! We'll get that fixed directly. Works just fine! Many thanks for all the hard work put in. If you want LibraryThing to do well: Rate the app! Give it five stars! What's there seems to work fine (Nexus 7 v.2) but I had hoped it could provide an offline version of your catalog when browsing a book store as my tablet is wi-fi only and I don't use a smartphone. Hurrah! Thanks very much for doing this - it's really useful, and seems to work fine so far on my phone (HTC One M9 with Android 7.0). Downloaded it last night and even scanned in my first book, one I'd bought at a used book store yesterday that wasn't on my wish list. This will be quite a time saver when entering new books. 2. HTML doesn't render in reviews, but appears as is (here is a screenshot). 3. I don't know if it's possible, but it would be nice if there was some kind of indication that the app could read a barcode, but that the barcode was not an ISBN. I kept hovering over a barcode, and jut could not get it to scan. Eventually I looked more closely at it and realized the numbers under the barcode did not match the book's ISBN, so I assume that's what was happening. I haven't had any problem scanning barcodes otherwise with my test books. >37 Jarandel: We hear you. Lots of folks requesting this, but we've currently got some other features we want to roll out first, before we look further into offline capabilities. Maybe further down the line. >40 Stevil2001: Thanks for the feedback! Sort not sticking is by design, I believe. The idea being that folks are more likely to be interested in what was most recently added to their catalog. The HTML in reviews issue may not be something we can fix, based on Android's rules—I'm checking with devs about that one. And, similarly, I'm not sure if there's a way for the scanner to recognize that it is, in fact, seeing a barcode, just one that it's not supposed to be able to read. I worry that we'd get too many false negatives. For example, I've got a few barcodes that are slightly obscured by label residue, which take some fiddling with the right scanning angle before they'll read. Chances are, those would get rejected. >40 Stevil2001: Devs confirm the HTML issue is a bug. We should be able to fix that! Thanks for reporting! I updated the OP to include this, too, but here's a video I made of speed-cataloging with the Android app. Add my vote to the pile of those requesting offline access to the catalogue. It's a very useful feature when you're browsing bookshops abroad (which is very easy to do here in Europe). >44 Petroglyph: Good luck with that request. Somewhere over on the iPhone discussion, they explained why it wasn't going to happen. It made sense (whatever the reason was, which I don't remember), and I moved on. I'm lucky that my phone gets decent signal even in the depths of the bookstore I frequent. I recently got a tablet and this is the first app I have downloaded. 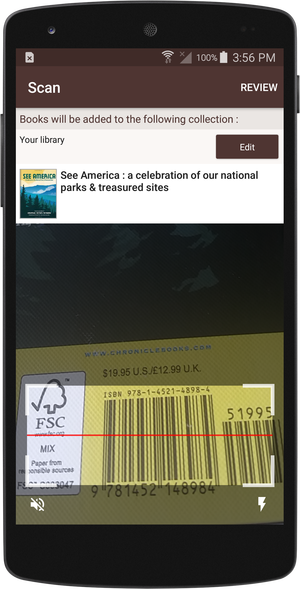 Just added a book using the bar code scanner—so easy! Thank you. Please add another vote for offline access. I think the app would be perfect then. Downloaded the app to my phone (Nexus 5X, Android 7.1.2) and it seems to work really well so far. Adding covers using the camera is an issue, though. On my phone, at least, the camera is inverted when I try to use it within the app. This makes taking pictures quite challenging to say the least. >48 shadrach_anki: Hmm, that's weird! Can you describe what you mean by inverted? When you open the barcode scanning feature, you should see the highlighted box with a red line through it for the barcode toward the bottom of your screen. The rest of the window should be sort of grayed out. Like this screenshot. I am holding my phone in the standard "upright" position for this, but as you can see, the camera is flipping what it is viewing upside down. This also inverts all the directions for moving the camera to focus on the image (shifting left moves it right, up moves it down, etc). >50 shadrach_anki: Thanks for the screenshot and details! A couple other things that might help us narrow this down: What type of device and Android version are you using? Android version usually be found under Settings > About phone. So excited to have this! I have a huge stack of books to catalog. Downloaded the app and scanned in one book using the barcode scanner. Haven't been able to scan another. I think I'm doing it right. Is anybody else having any issues? I was involved in the IOS discussion, and I'm aware that staff offline access will only be added in the far future, if at all. But it never hurts to state requests for additional features loudly and unambiguously. >16 lorax: Do I need to ... reinstall to get the current version, or is the beta labeling just stale? Does the released (non-beta) version of the App, on the Account page under the logo, show: Version 1.0 (build 19) as it does on my up-to-date Beta version? I ask because the build number is important when reporting bugs. >55 civitas: The released version is build 19. And yes, it will show in that place. >53 shadrach_anki: We haven't been able to reproduce this behavior so far. When you open the camera to take pictures of your covers within the app, is it initially upside down, or do you see it right side up first, and then the camera rotates? If the latter, it may be your device's reading the angle at which you're holding it, and turning on screen lock, or experimenting with taking the picture at a slightly different angle may help. >57 lorannen: It is initially upside down, and no amount of phone rotating changes that orientation. The app does not exhibit this behavior in the barcode scanner, only if I try to use it to take pictures of book covers. 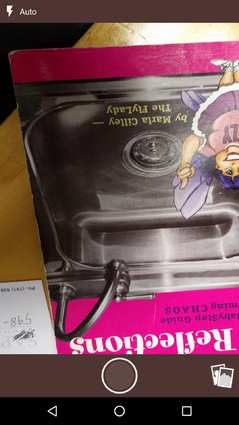 If you take the picture, does the cover end up upside-down, or does it get flipped back to the correct orientation? >1 lorannen: The LibraryThing Android app has arrived! A long anticipated summer always arrives with bugs. There is a thread in the Bug Collectors group (LT Android app (Alpha/Beta)) for consolidating beta App bugs. Are you going to create a corresponding collection thread for the released version? Or, should we just go ahead and enter bugs individually? >59 lorax: The picture remains upside-down. >60 civitas: Here we go: https://www.librarything.com/topic/259639. One thread to rule them all, for now. I just downloaded the app and went to work with it entering a number of books to my library that had been sitting around. The bar-code reader is fast! Having a library of sometimes relatively obscure books formerly made it difficult to enter my books but today that changed! Installation was to a Samsung Galaxy S7 and the install was seamless. Saw this morning that Android app was now available and I did the happy dance. After work I went and collected some books that I had ordered. Once home, I decided to try the scan feature in the add to catalogue and wow, what a great working feature. I scanned five books and it was so quick and easy. Thanks for making the android app a reality. It's great for scaning new books and I've also used it to check my wishlist and my library catalogue. The search engine is great also, as I used that to search for an author I knew I had in the my collection but I didn't know what number in the series I was up to. Quick results, found the information, which helped me determine whether to buy/not buy a book - note: I did buy a book based on what my collection said I didn't own. I downloaded the app to my Samsung Galaxy J1 Mini - but can't work out how to get it to work. I got as far as placing the phone over the barcode of my book - and it seemed ready to work - but how do you make it scan? Is there a "Librarything App for Dummies" yet? >65 noellib: If it's an actual ISBN barcode, it should scan automatically. There's no button to press or anything to make it scan. If you're having trouble with scanning, we've got some tips that might help on the App Help page. The easiest one to check is to make sure you've got decent lighting, or turn on your phone's flash. Try bringing your phone closer to or farther away from the barcode in question, and especially make sure to try a couple of different barcodes. I've got a few books in my collection that never seem to scan, due to the barcode being scuffed up or partly obscured by label residue. I tried to scan three books today. The first one, Family Food, went excellently, but the others, Fish & Fish (Dutch translation), and Proef Oranjebloesem did not do anything. Could it be because they are not on Amazon.com? Is there any way to add more sources to use in the app? Vlaamse Centrale Catalogus usually does well with my books. I'm just wondering, and apologies if this was answered in iOS talk, but can we take inventory using this app? >69 knotbox: I don't think so, but would I love that. Thanks for your advice - but it still doesn't work for me. I followed the instructions in App Help Page and tried with several books, all with very clear ISBN barcodes. Perhaps my phone camera is not up to the job? Thanks for releasing the Android version. You can download the same app on tablets and phones and works great in both. I have the phone version (the only available for iOS) on my iPad and does not look smooth and as part of the of the system. I love how easy is to add covers to your books by taking a picture with the device's camera, and even cropping and editing them before uploading it. I really love the app. It is simple to use and attractive to look at. I had a couple of questions, mainly out of curiosity rather than anything else, and apologies if they were previously asked and answered. Would you ever consider a quick add of tags? For me, I think this would be there most useful feature that isn't currently supported. Where does the genre information come from? I've never seen that before. Awesome! I had already installed the unpublished app, but it's great to see version 1.0! I can't believe how fast and easy the scanner works! I read eBooks exclusively now but I still have a few paper books that I haven's added to my library so now I can get them done in no time. When do you expect to add a recommendations button on the app ? Is by Labor Day being too hopeful ? Will this be available at the Amazon app store for Kindle users? >79 seward78courtright: I suggest you post your question on the thread listed below. I don't think it's a bug, but should I repost my request to take inventory with the app in that thread too? >80 ulmannc: That's not a bug. It was mentioned in another thread, but I can't find it at the moment . The answer was no. But you should be able to side load it, as Kindle Fire tablets are modified Android operating systems and will allow that. >82 gilroy: You are right! I misread the intro on the bug thread. I downloaded the app and it appears to work fine. I use tags more than most other features, including checking for a book when I can't remember the exact title but I know the tags I associated with it. Right now tags do get searched but anything with the search word also shows up in the search. I'd request more specific tag features. However, thanks for getting an Android app out there for us! Right now tags do get searched but anything with the search word also shows up in the search. Thanks so much for the app - it is good to see it. I'm having the same issue with camera upsidedown. Nexus 5X Android 7.1.2. Also, can I suggest that at some future stage, the image editing for covers has an easier way to crop? For example, CamScanner auto-detects edges (even if angled) which is really nice. Also, my fingers found it a little too easy to move the image rather than crop - could crop mode just be confined to cropping? Anyway, thanks again - great development. >85 lorax: I think he means that he gets books with history in the title as well since there doesn't seem to be a way to limit the search to just tags. >75 sturlington: We're considering adding the tagging feature to the app (among a couple other things) as our next major improvement. Genre, I believe, comes from LoC Subject Headings, and is not editable. >78 AquariusNat: That's much too soon, I'm afraid. We've got some other features in the pipe line to finish first. Can you tell me more about what aspects of Recommendations you'd like to see if we do tackle adding them to the app? There are lot of different varieties of Recommendations on LT! >79 seward78courtright: Not currently, but we're looking into it (https://www.librarything.com/topic/247434#6077663). >81 knotbox: No need to re-post. We've got that request on our radar. Plus, it's not a bug. I am thinking of the automatic recommendations. The member recs could probably wait awhile . THere's a new beta version available that has multiple bug fixes/improvements. I've created a new Talk thread to keep up with releases and announcements for the app. Is "genre" coming into the app? >91 timspalding: Yep! On detail pages. >68 wester:, >71 gilroy:, >72 JerryMmm: The books that won't scan are on overcat, so it seems it's not the catalogue; there must some other cause they won't scan. I do suppose one scan-able out of three is an improvement over zero, but there definitely is room for further improvement. The scanning works beautifully for me (Samsung G7 Edge). The book gets catalogued into the "My library" collection. Is there a way to change this when more than one collection is available? Thank you. can I toggle my books to display title/author only without covers? just like the book catalogue app, from where I knew the name of this site. And secondly in case of Bengali Language book name is not showing alphabetically. 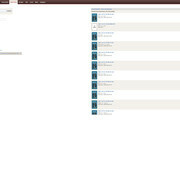 >95 drasvola: What happens if you change the default collection on the Add Books page in a web browser the usual way? I think he means that he gets books with history in the title as well since there doesn't seem to be a way to limit the search to just tags. Thanks. I've found the procedure by myself. Clicking on the scan icon will bring up an edit page where the collection for cataloguing can be set. >94 wester: I've got a few barcodes on my own books that won't scan, due to being worn away, or otherwise obscured on the cover. If 1/3 scanning properly continues to be your average, that's definitely a problem, and not how it should be working. >96 ovmanyu: There is currently no way to set your catalog to display without covers, but you're not the first to request that ability. We don't have a plan to add that at the moment, but maybe in future updates. >95 drasvola: You can select the collection during the Add Books process. It's at the top of the scanning screen or the bottom of the book details screen if you're doing a typed search. Many thanks for the additional information. Great application! We tested the app on the Amazon Fire tablet and, unfortunately, it's going to take a little more time to get it ready for the Amazon store. There are differences in the Android version that Amazon uses for its devices and we'll need to program around those differences before releasing. If all goes well we might have something within a week or so. The app loads perfectly on my 10" tablet (with a custom android OS). Thanks for this. It really helps. A couple of UI suggestions for a future version (Please excuse me if these have already been suggested. There are so many comments that I could not read them all.). 1. It would be great to display the user name, once he/she has signed in. If you could place it on the right of the title bar, it would display on every site page. Right now, the user doesn't know for sure that they are signed in. 2. If a link in the app takes you to a page on the website that displays in your browser instead of the app, could you automatically sign the user in on the browser page, since they are already signed in on the app? An example is the link in the news section to the June early reviewers page. Right now, you have to sign in again when the link takes you there. 3. A Contact/Help/Support link on the site would really help. >105 Sundevyl: Thanks for the suggestions. 1. We can't do that because there are some users with insanely long usernames. Space is at a premium on mobile devices. And pretty much every action causes you to be signed in. The app prompts you if it needs to. 2. This should be happening already. If it's not then it's a bug. 3. I'll look at finding a place for that. This message has been deleted by its author. >106 conceptDawg: Signed in, yes, but to which account? This is great! I was able to add a whole shelf of books in no time from my phone! The scan and search is super fast! I had been just typing in ISBNs on my computer, the little kitty scanner never worked all that well, so this phone app is fantastic. I know I was upset that Apple users got it first, but I'm pleased at how this Android app turned out. It didn't update the number of books in my collection, but perhaps it will when I restart my phone. The collection update is on my desktop version. And so easy to add a cover picture. Thank you!! >109 cnfoht: You can force this to refresh by dragging and pulling down on the top of that list! It will also automatically refresh if you quit the app and come back to it. An unable to scan the Blu-Ray DVD if Disney Pixar Finding Dory. I think it is a UPC. I'm so glad the app is out! I spent much of today recommending it to everyone. 1. I was wondering if there is any way a future update could make adding a read date a minor edit instead of linking to the full site? One of the main things I like is to keep track of when I read books and it's still really cumbersome to do on the app. 2. I also saw a comment about making formats--ebook, paperback, etc--visible when searching. I'd love to see that, too, in a future update and it listed in the minor edits page for things in your collection. I currently do have different collections for formats as a work around as suggested, but that doesn't entirely solve the matter when searching/adding. I am unable to scan a 1981 book Betty Cricket's Chinese Cookbook. It has a strange ISBN & bar code. Has the format evolved since then? So, the ISBN works. Type it in and see. But the UPC is, like a good many, is a mass-market paperback. Basically, these numbers don't identify the book, but merely the general thing and price. Many many books have the UPC 07980800995. So you have to scan the ISBN. Conceptdawg. Scanning that UPC should GIVE you a message about mass-market UPCs. It does within Add Books. Is it not doing so within the app? On the iPhone, when I scan that (off the screen) it gives me that message—No results… You are probably scanning a mass market paperback, etc. This is true on the Android, right? Now if I could organize my books into groups like:fiction,non-fiction,poetry,essays,cooking &Diet books,arts&crafts. Is that what "tags"are for? I've spent the last 3 (or is it 4?) days enjoying the mobile phone app. The download to my Nexus 5 was flawless even though it is an older android (vers. 6.0.1, Bld M4B30Z). And I'm loving the software! Big kudos to the devs that came up with this. So far, no bugs have been evident. My only downside is that I'm way behind on writing some reviews because it is so easy to scan in my library. I'm addicted to reviewing the books, since I'm pretty selective about what I choose to keep. I am also amazed at how many of my books don't have an ISBN (never mind a bar code). So lots of manual work still to go. But at least this app is great for bar coded books. I really love the Android app. Thanks so much. One feature I'd like to suggest for a future release is to be able to view a list of your tags with the number of books you own for each tag like you're able to with the computer version. I use that feature a lot. I was so excited for an Android app. I loved it on my iphone. Unfortunately, it doesn't allow me to scan bar codes. I tried uninstalling it and reinstalling,. Still doesn't work. It does allow me to manually add them. Using a Samsung 7 edge. Unfortunately, it doesn't allow me to scan bar codes. Can you describe how it fails? Does the camera not come up? Does it never see anything? Etc. The android app should also show you the message about mass market paperback on some UPC scans. The android scanner actually scans MORE barcodes than the iOS version (ie, it accepts some kinds of barcode that the iOS version doesn't recognize). We've thought about limiting it a bit more (no UPCs for instance) but I feel like the mass-market message is important in some cases. >117 ccbarr: You can use tags for that. Or you can create Collections and put the books into those collections. It's really a personal preference in how you think/organize. Also, for the first few years of its life LibraryThing didn't have Collections so everybody used Tags. But now, they are two solutions to similar problems. I think most people use Collections for the thing that you are describing and use Tags for interesting keywords, topics, etc. for each book. So you could tag a book "WWII, war, Europe, germany" and and put it in the "History" Collection. Unfortunately, the editing of Collections is limited to the website. That feature is coming to the app in the next major release. But you can edit all of your Collections on the site and then they will be available from within the app. It does not scan at all, so no message. It acts like it would if I focused on the floor or my hand. I've created new categories to add different types of groups. However, this is a manual designation. It is nice that they can belong to as many different categories as you like. Not really sure myself how tags work. I see a count on my android for each category in my catalog. Not tags. I agree. I spent hours on the first day trying to find the button to take the scan. I didn't realize it would do it automatically if it liked it. BTW, I love the jump to first unread function on here. Takes the pain out of a big thread. Maybe I didn't fully describe the issue. On the regular site, you can access tags directly. That is what I would want to do. As a second best approach, I tried using the search function, but that isn't a good substitute because of the issue I described. Yes, search works as you would expect, but I would have liked to be able to just access my tags. I actually ran into this last night when I wanted to check if I had a book that would be among those I tag a certain way. Thing is, there is still always the browser version. So not a big thing for me really. Ah, got it. So the issue isn't so much with search (which works the same on site and the app), as with not being able to access the list of tags? But it sounds like your use-case was primarily "Do I have this book" (for which you can search within the app) and secondarily "Do I have this book with this tag", and that your preferred workflow of answering that question is "Go to my list of tags, navigate to my chosen tag, and look at the list of books thus tagged?" "Go to my list of tags and click on the one I want to look for" is just an alternative (and IMO clunkier, but that's personal preference) way to get to the same result as "Search for books tagged with a particular tag". Or am I still not understanding you? I am having some issues with the barcode scanner and cover finder camera feature. I have a few hundred more books to scan, but the camera interface is glitchy. It often refuses to focus at all, but I have tested my camera and it focuses normally in all other apps. I often give up and type the ISBN manually. The camera screen for the cover making section is nearly entirely lime green with a small sliver of the actual camera view on the right-hand side when I try to take a picture. Other than this issue, I really like the app. It should help me from buying duplicate volumes. It can be hard to remember what you already have with a large collection. I have a Samsung Galaxy Express 3 (Samsung J1) with 6.0.1 Android. We are working on a fix for the focusing issues. I haven't been active on LT much, but I anticipate a surge, not just playing around with the app, but adding covers to some of my uncommon items that lack them. I've been wanting to do that, but it always seemed to involve two devices; now I can do it on one. Hmm. Just downloaded it from Google Play and my Avast anti-virus told me it contained malware. Uninstalled! Any idea what's up with this? Thanks! I also use the tag feature to classify my books. It would be great to be able to browse using tags and also to be able to enter tags when adding a book. Otherwise, the application work nicely! Woohoo! I downloaded it today. Haven't tested out the add books feature yet but I'm excited to. >134 dragonflyseye: For what it is worth, I also use Avast on my android phone and I did not get any warnings. Interesting. I suspect it may be a false positive, but like to be cautious. Probably just need to load it and not worry about the warning. Thanks for the info. From everything that I've read about Avast I'm a bit leery of working with it. It seems like a scheme to eventually pull money from developers to get their apps whitelisted in Avast. We CAN get the app whitelisted but it means that we have to send them a copy of our binary every time we have a new build so that they can "analyze" it. This screams scam, as well as slowing down all development while we wait on their results. So, long story short, we're not going to play that game. One feature I would love to see, that would finally cause me to leave GoodReads, would be an easy one-click option to "Start reading" and "finish reading" that would just populate the relevant reading dates for the book, based on the current date. >141 alanz: Thanks for the feedback. That would be a great feature to have and we'll discuss it. Please make any connection between "Currently Reading" and the dates optional or at least editable - not everyone checks LT every day to get the dates set correctly, and some people use Currently Reading but not the read dates, or vice versa. I love Avast on my computer, it's a very good free antivirus. On mobile it just slows down my operating system. Speaking of reading dates - it would be great to see the start/end dates on the primary book page (the page that appears after you click on the book in the catalog). I'd find that much more useful than Publication. >145 r.orrison: well, I find the publication info invaluable, I put the exact edition there, and condition, so that should not be removed. Reading dates for me are minutiae that don't interest me at all, let alone on the quick overview screen. Love the app so far. The new update allowed me to save it to my external memory, which all apps should have. I would like to be able to toggle on and off what is visible when viewing a book in the quick overview screen. I don't care about member tags so I want to turn those off, but I would like to be able to see what format I own a book in without having to select edit to see full details. >147 Burkshelf: Thanks for the feedback, and glad to hear you're enjoying it! We don't currently have plans to make detail pages customizable in the way you're describing, but I'll certainly make sure the developers get see your request. I don't mind the app itself being in English, but please add an option for which language version of the website to open when editing a book/work! I keep adding (incorrect) Common Knowledge to the English Common Knowledge section as I'm not used to having to switch to German first. As I can't do more than just change the English entries back to an empty string (deletion is not possible) the English Common Knowledge now shows nothing for several books where it could pull in the German values. So please make it possible to show the German (or other language) version of LT when editing a book! EDIT: If you do that, maybe make it default to the OS language automatically if available, so that non-English users don't have to change that setting manually. But keep it changeable so that people who like their Android in English still can use the German LT site, e.g.. Thanks for the idea. CH, can we have it go to an intermediate page that picks your version based on the language? Is it possible to search my catalogue using the bar code scanner? That is, not to add new books, but just have it scan the bar code and search the catalogue for that ISBN? Or, you could just enter the author's name in the search box on the app and see if you have it. If the title is more unique, search for that. Someday it might be a feature but I wouldn't delay using it until then. :) Someday can be years as past experience with LT feature requests proves. Oh, I think everyone knows that it is possible to search in the app, people are asking about this particular method. I don't really want all that data piling up on my phone, and I'd like it to be accessible online so I can see it from all my devices. However, maybe a download .csv or flat list of my catalog would serve the same function. It wouldn't provide all the services, but at least I could check my inventory to avoid dupes or to check if I have #9 in the series. If you wanted to make it fancier, could build a "reader" that could present that download nicely, make it searchable on a couple fields. User would download when signal is available. This approach would spare those of us with limited space from overloading, and still allow limited offline info. I don't think storage on the device is too much of an issue, as long as no covers are included it can't be more than a few megabytes for the whole catalogue. Only recovering it for the first time then updating at the user's request would take care of limited storage, limited data plans and/or shifting in and out of phone signal/wifi areas. anyhoo, thanks for giving it your attention! >130 lorax: Sorry for the late response. My problem was probably just a special case type thing - a couple of situations that are probably not general enough to worry about. (1) I can remember how I tagged a book, but for the life of me I can't remember the title. I can just continue to go to the browser site for this. (2) I have in my hand a book that looks interesting but I think I may have way too many books in a particular custom tag already, so I want to check before adding. This I can use the search for. It won't get me exactly what I want, or I may have to do multiple searches, but it will be close. Or I can just use the browser website. I can see how the app is useful for inputting a large number of books at once. (watched the video!). I might try this if I decide to enter my media library and it works for dvds and cds. That would be kind of nice. (unless the little Cat scanner works on dvds and cds, I have one) Currently my dvds are on an incomplete spreadsheet and my cds are jpgs in a file folder (w/ tags, lol). I wanted to add that I also miss the feature to scan an ISBN code to find it in my library. It would be so much easier to prevent buying books twice (or more...). I must say that I have never procrastinated LESS than I do now in getting new books in my catalogue! Because it's just SO EASY TO ADD NEW BOOKS! >161 Saradoc: It's not at the top of our list right now, but it is highly requested, so it's on our radar. >162 knotbox: Us? Enable people to buy books? Well I never...! Love the app! The scanner is extremely convenient and fast. I wanted to let you know that I got very confused as to what to do next when adding, though -- eventually I clicked over through "Review" because I ran out of other buttons but I was pretty convinced it was going to let me write or read book reviews, not double-check what I'd added. I was expecting "Save" or "Accept" button language instead (or even no button with an instasave). It is all clear now what the workflow is intended to be, of course. Just wanted to pass the insta-usability feedback on. Thanks for the nifty app! >164 pammab: Thanks for the feedback! We really appreciate it. The lack of a "Save" button is by design—mostly for the sake of speed. While we're looking forward to adding features like editing/adding tags and reviews down the line, the Review page you found while scanning is there to allow members to look over what they've added in their most recent scanning session—that way you don't have to stare at the screen and wait for it to complete searching and adding one book, before you move onto scanning the next. It makes for much faster cataloging larger quantities of books. >165 lorannen: But still, Review seems to be a poor choice of words. >166 jjwilson61: I'm open to other suggestions. I'd agree with you if it weren't for the fact that this only appears in scan mode, after you've scanned at least one item. It needs to be short, obviously, because space on mobile is precious. Oh my goodness, oh my goodness. It was a breeze today to add 35 titles that I just haven't felt like manually loading. I'm so lazy. :) I'm gonna giggle the next time I'm in the bookstore or library & I pull out my phone to check... Do I already have that? Have I already read it? Do I have it on Kindle but want it on paper? (I'm quite known for purchasing duplicates). This made my weekend. "Proceed" gives the sense of "you need to click this for your next step", so that might stand in for "Review". Another idea (second choice from me), "Verify" is less overloaded than "Review" in LT's context. I also found "review" confusing and "proceed" or "continue" sound perfect to me. >171 igorken: Point taken, but I feel like "proceed" or "continue" both give the impression that there's an extra step one must complete before the books are actually added, when this is not the case. Not to belabor this! Just an idea for a future release. >173 pammab: Yep! The "Review" button is just for—um, "reviewing" the list of what's been added in your current scan session. Barcodes that scan get instantly saved to your collections! Would "Review List" be better? "Review Additions"? I use the App to quickly check to see if I already have a book. It's great! I also like that I can quickly go to the full LT page from the link View on LibraryThing at the bottom of a book's detail to see other books in a series and whether I have them or not. I haven't tried adding books because I'm a control freak and like using the Add books feature of LT, but I can see how it would be beneficial to get a lot of books in quickly. They've already been added, so verify and confirm don't seem appropriate (there isn't an option to confirm or reject them). I like "Recent" or if there's room "Recent Additions"
"Finish" which is used in most installation routine might work. But the books are already added, so you don't actually need to click the button to finish the job. Installations are completed already, too. It's like "clear". Ya, you don't have to click on the Finish button on installations, clicking the X to close the window works the same (usually). I like "recent" for that. (Also it matches "recently added" on the website add books.) It's pretty clear that "review" isn't clear. #1 wish is that when I manually enter an ISBN and then go to manually enter another one, it clears the search box so I don't have to highlight + delete the previous one first. It would also be nice if a manually-entered ISBN that had only one result didn't make me go though so many extra confirm steps compared to scanning. I realize Tim thinks all manual entry is untrustworthy, but the chance of a mistyped ISBN being valid is not much higher than a mis-scanned one. >174 lorannen: what about Scanned, that's literally what it is is it not? Great App, I would suggest it would be able to sort the list, in dewey number, that way it would be easier to order the Library outside the app. Any news about upcoming features would be appreciated ! Hi, I'm answering here to a response on the iPhone thread to a question I asked about the android app. Hi, couldn't find a thread for the Android app, so I'm posting here. The app is great and so far no issues. Just one thing that maybe I'm missing. So far when I added a book I had no problem finding it, since it was in English and I assume the default source is Amazon. However, when I want to search in a different source for a book in a non-English language I can't find it. I have to do it using my desktop PC. Is there any way to change the source when using the app? if not, I think there should be one. I routinely alternate between 2 sources. Check Libraries, if it isn't checked. Uncheck Amazon, if you don't want to use it. Make sure Quick Find is OFF, otherwise it will take the first option it comes across." I've played with it a bit. I tried checking both libraries and Amazon, unchecking Amazon, disabling quick find. It changed the results but didn't show the correct ones on the app. This is a search for the book A Tale of Love and Darkness in Hebrew, the original language. On the left is the search on my PC with the correct results. On the right is the search on the app. Amazon was unchecked, Libraries was checked, quick find disabled. Is there a way to have the default as amazon.co.uk rather than amazon.com? I can't see how to do this anyway. Thanks. >193 conceptDawg: Not at this point but that option is coming in the next major release. App is great, I’ve been playing with it all day. Is there a way to customize what shows in the book list in the app? I’d like to see Dewey decimal #s without having to toggle through two clicks. Do you have an ETA for this next major release? As a French user, a lot of my books are not referenced on amazon.com, even though they are on amazon.fr, which forces me to use the desktop version. I don't have a definite time frame, but sometime very soon. It's finally in development. A month, possibly? Isn't the proper answer, "two weeks?" Does the app not remember usernames and passwords, or is it something to do with my phone? Alternatively, if I log in to LibraryThing on my phone's browser, is there some way to get to the app from there? >198 alaudacorax: By "remember"—do you mean that it's logging you out? On my phone (Android) I remain logged in until I actively log myself out of my LT account. Or are you looking for an autofill option so you don't have to enter in your username/password? There's a way to get from the app (while looking at a book) to the main site in your phone's browser, but the reverse is not currently true, I'm afraid. Yes, I was looking for an autofill option as I have separate accounts for DVDs, CDs, etc., and I use long and complex passwords - which are a pain to enter on a mobile phone. Actually, I've realised it doesn't really matter as I doubt I'll use the app more than once on each account - one massive bout of cataloguing and then it will only be one or two at a time as I buy new items - for which I won't really need to scan barcodes. >200 alaudacorax: I use a password manager on both my computer and my phone. I log into it and it takes care of remembering stuff for me. So I only have to remember one long and complex password. I've been using it for years and have been very happy with it. There are a number of them out there. The one I use is LastPass. >200 alaudacorax: Yeah, that's not something our app does, I'm afraid. Depending on your phone, it might be a possibility, but that's usually a browser-feature, if I remember correctly. 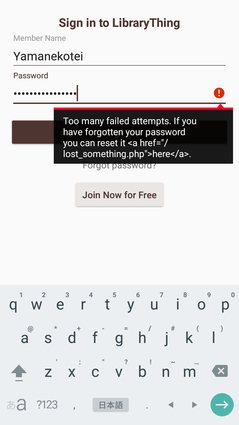 A password manager, as suggested in >201 PhaedraB: is a good alternative. This is off-topic, but thanks for reminding about the password manager - I've been meaning to get one for ages and never getting round to it. I gather it's a bit silly to be as security-conscious as I am and NOT use a password manager. >203 alaudacorax: Continuing to be off-topic, if you're looking to select a manager I really like this recent overview of several popular programs. I like Keepass myself, but I have family members who find it tricky to use and I'm presently researching an alternate. >204 MyriadBooks: Thanks for that, MyriadBooks. Thanks for this great app! 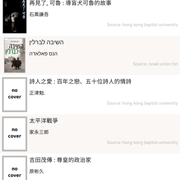 Although really looking forward to having more data source options -- with non-English books, unfortunately, I cannot use the otherwise very convenient app. >206 daroczig: Of course you can use it. I use it all the time. You cannot use it for adding books, but it's great for checking what you already have when you're in a shop. >207 anglemark: Except that requires data, so no, it's not. But this is a road that's been traveled before. >208 .Monkey. : You're right, I live in the land of affordable data plans where everyone has one, so I tend to forget that. I live in the same country, and I don't have one. >206 daroczig: The wait is almost over! You should expect our updated iOS App sometime this week, and the Android update within the 1-2 weeks thereafter. We're adding (a bunch of) new data sources with the update. :) Stay tuned. To be clear, we're adding ALL of the datasources. If it's available on LT.com for adding books then it will be available via the app. Very soon. >213 conceptDawg: This is extremely exciting! And even more incentive to finally catalog all my books, not just the ones I'm currently reading. That is very exciting! It might make the app useful for me again! Will it be easier to switch between sources? >215 melannen: Depends on your definition of "easier"—you'll have to go into the "Account" page to do it, and there's no way to switch between them in one cataloging session. >213 conceptDawg: Very soon. So like "two weeks"? iOS is going out tomorrow, so a couple of days to go through the Apple mothership. Just to be complete: v1.1.1 of the Android app is available.